What would you do if you saw a person in the local coffee shop who had a severe deformity? What would your reaction be? Would you stare at them, ignore them, maybe steal a glance? Reading this story not only makes you think about how you might react, but how it would make the other person feel. 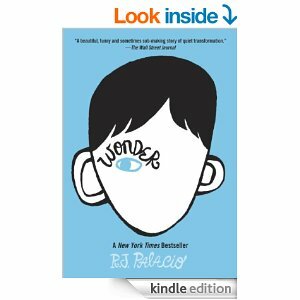 “Wonder” is an amazing story about a boy named August who has a severe facial deformity. The story changes the POV several times among August’s relatives and friends. The author, R.J. Palacio, does such a great job of putting the reader into each of the characters shoes. I love the subtle descriptions of how people react to the main character and he notices every glance and internalizes every reaction. All the characters grow throughout the book. There are many character arcs. I must say, I had a little tear in my eye during the last few chapters, but I’m a sucker for inspirational stories. I couldn’t put it down, even to go get a tissue. This is simply a must read for every kid in grade 5-7. In fact, my son’s class read it together in 5th grade and it was a big hit. It encouraged so much great discussion about sensitivity. A great topic for entering middle schoolers. Previous Previous post: Just Keep Writing.